TALLAHASSEE, Fla. — Among the newly released recordings of 911 calls from deadly Florida school shooting, the parents of a 17-year-old girl can be heard telling a dispatcher that their daughter is texting from a classroom where the door’s glass was shot out. “Three shot in her room. Oh my God. Oh my God,” the mother says, raising her voice. As Florida’s Republican governor keeps everyone in suspense about whether he’ll sign the legislature’s response to the massacre of 17 people by a teenager with an assault rifle, the 12 minutes of radio transmissions released by the Broward County Sheriff’s Office highlight the chaos at Marjory Stoneman Douglas High School. The material includes 10 of the 81 recordings of frantic calls by students and parents. Responding deputies and officers desperately tried to sort through a chaotic scene, treat the injured, lock down the school and locate the shooter. The excerpts show a deputy on school grounds first thought the loud bangs were firecrackers, then realized they were gunshots — yet he never ran toward them. Other responding deputies and officers desperately tried to sort through a chaotic scene, treat the injured, lock down the school and locate the shooter. The bill Gov. Rick Scott is weighing narrowly passed Florida’s House and Senate. It falls short of what he wanted and what survivors of the massacre demanded, and both teachers unions and the National Rifle Association are opposed. “We know that when it comes to preventing future acts of school violence, today’s vote is just the beginning of our journey. 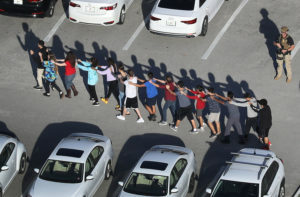 We applaud the members of the Florida Legislature that courageously voted against their own political self-interest to do the right thing for the safety of our schools. This Time Must Be Different!” the letter read, in part. Scott said he plans to meet with those families on Friday. “I’m going to take the time and I’m going to read the bill and I’m going to talk to families,” said Scott, who had received top marks from NRA for supporting gun-rights measures in the past. He broke with the lobbying group after the shootings, and his new stance reinvigorated the gun-control movement. The measure would raise the minimum age to buy rifles from 18 to 21, extend a three-day waiting period for handgun purchases to include long guns, and ban bump stocks that allow guns to mimic fully automatic fire. As for schools, it would create a so-called guardian program enabling school staffers with law enforcement training and school district approval to carry concealed handguns on campus. It would create new mental health programs for schools and establish an anonymous tip line where students and others could report threats. It also seeks to improve communication between schools, law enforcement and state agencies. The NRA opposes raising age limits to buy weapons or imposing new waiting periods. In a statement Thursday, NRA and Unified Sportsmen of Florida lobbyist Marion Hammer called the bill “a display of bullying and coercion” that would violate Second Amendment rights and punish law-abiding citizens. Teachers, meanwhile, called on Scott to use his line-item veto power to zero out the $67 million set aside for the program to train and arm school employees. The Florida Education Association on Thursday sent a letter to Scott saying the only people who should have guns in schools need to be trained law enforcement. The governor, who is expected to seek a U.S. Senate seat later this year, has called for raising the minimum age to purchase any type of gun, but he does not support arming teachers. Instead, he wanted lawmakers to adopt his own $500 million proposal to put at least one law enforcement officer in every school. The governor has 15 days to sign a new gun bill. The governor has 15 days to sign the measure, veto it or let it become law without his signature. Sen. Bill Galvano, a Bradenton Republican and one of the main sponsors of the legislation, says he expects Scott will sign it. “The bill is far too comprehensive for the governor to let a few provisions prevent the positive changes this bill embodies,” Galvano said. President Donald Trump congratulated Florida lawmakers, saying they “passed a lot of very good legislation last night.” Trump also said Thursday that the White House is working on a plan to ban bump stocks, and efforts to enhance background checks were “moving along well” in Congress. Andrew Pollack, whose daughter was among those killed, said more needed to be done, but there’s enough good in the bill that it should pass. The suspect in the attack, Nikolas Cruz, a 19-year-old former Marjory Stoneman Douglas High School student, faces 17 counts of first-degree murder and 17 counts of attempted murder for the massacre. Cruz’s public defender has said he will plead guilty if prosecutors take the death penalty off the table and sentence him to life in prison instead. Prosecutors have not announced a decision. Associated Press writers Terry Spencer, Jennifer Kay and Adriana Gomez Licon in Miami contributed to this report.